The presidential-congressional relationship is the most important and vivid of all the inter-branch relationships. It defines presidential activities, priorities, and successes. No president, from Eisenhower to Nixon to Reagan, has been able to ignore or denigrate that relationship. Presidential Relations with Congress provides a succinct analysis of contemporary presidential-congressional relations in the post-World War II era. Richard S. Conley underscores what scholars have learned about presidents' interactions with Congress over time, the factors that account for success, and the methodologies that can measure success. 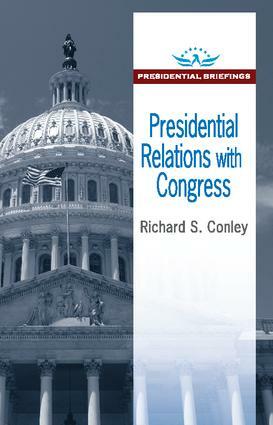 He weaves the "bargaining", "institutional constraint", and "personality" perspectives of presidential relations with Congress alongside case studies of individual presidents' approaches, including agenda success, veto politics, and Supreme Court nominations. Presidential Relations with Congress emphasizes the changing nature of internal dynamics in Congress, as well as the importance of party control of both the White House and Capitol Hill. This engaging addition to the Presidential Briefings series provides students, scholars, and observers of presidential politics with an accessible and readable tool for analyzing and evaluating presidents' varied styles, successes, and failures in their relationships with Congress. Each chapter features specific examples of past presidents' approaches to influencing Congress.